The Most Beautiful Candy Store in the World! If you're like me, I love old architecture. Today's works cannot hold a candle to the workmanship of days gone by. When I stumbled upon this image, I nearly fell out of my seat. 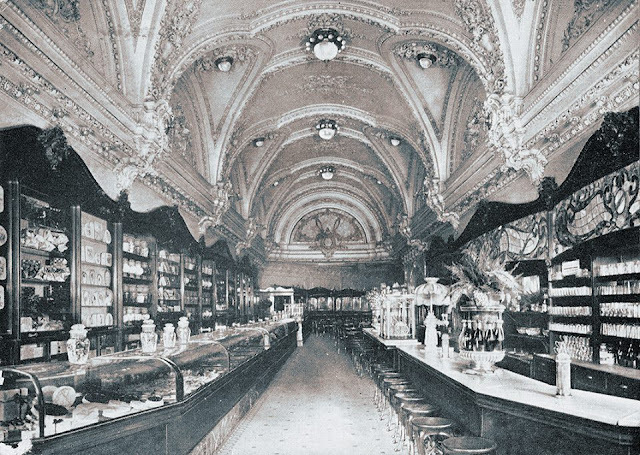 It was located in the Phelan Building at 770 Market Street in San Francisco, and deemed "The most beautiful candy store in the world." It was George Haas and Sons Candy Store. If you click on this image, you could really see the detail full-scale. Note the candy counter on the left, the soda and ice cream counter on the right, and sit-down service in the rear. Exciting New Arrivals at Paris Hotel Boutique! Happy Thursday! It's a Party! New Estate Arrivals at Paris Hotel Boutique! Happy Monday & Heads Up!